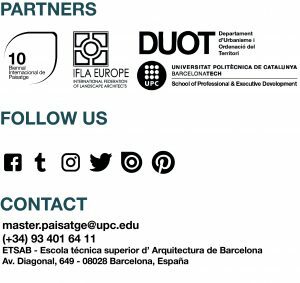 EHEA & IFLA EUROPE – Master in Landscape Architecture Barcelona – Universitat Politècnica de Catalunya – 35ª EDITION. The European Higher Education Area (EHEA) was launched along with the Bologna Process’ decade anniversary, in March 2010, during the Budapest-Vienna Ministerial Conference. As the main objective of the Bologna Process since its inception in 1999, the EHEA was meant to ensure more comparable, compatible and coherent systems of higher education in Europe. Master Programme recognized by the European Region of the International Federation of Landscape Architects. IFLA Europe operates a School Recognition Panel whose aim is to monitor and review compatibility of landscape architectural programmes in reference to the goals of the Federation and proclaimed education standards and requirements. Guidance document on the procedure for recognition of Landscape Architecture Programmes in the European Region.